The Yorkshire Window Boxes by Mayne offer the look of wood without the maintenance. These handsome window planter boxes bring home the charm of the East Coast while offering a low maintenance solution to enhance your homes exterior. Dress up any boring window while adding a touch of natural beauty with these classically styled plant boxes. 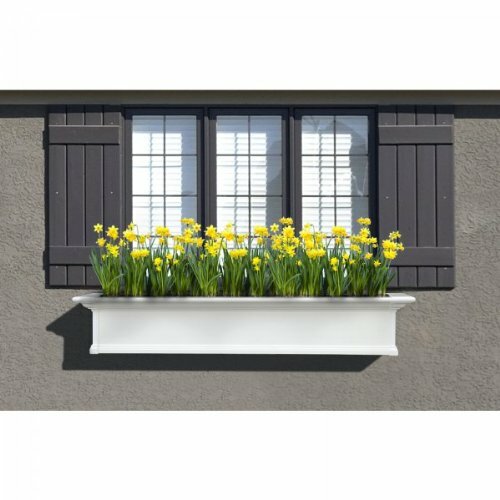 Yorkshire Window Boxes by Mayne Feature: Made from high quality white vinyl to go with any homes exterior. Decorative brackets available separately in sets of two. Each box includes two steel wall mounting brackets with screws These are not the decorative brackets. Panels can be cut to create a custom fit for your windows Sub irrigation water system encourages root growth Planter boxes ship ready to assemble. Made from high quality white vinyl to go with any homes exterior. Decorative brackets available separately in sets of two. Each box includes two steel wall mounting brackets with screws These are not the decorative brackets.